I watched this passion vine butterfly flitting around on a hedge, laying eggs atop the leaves of, you guessed it, a passion vine growing in the hedge. 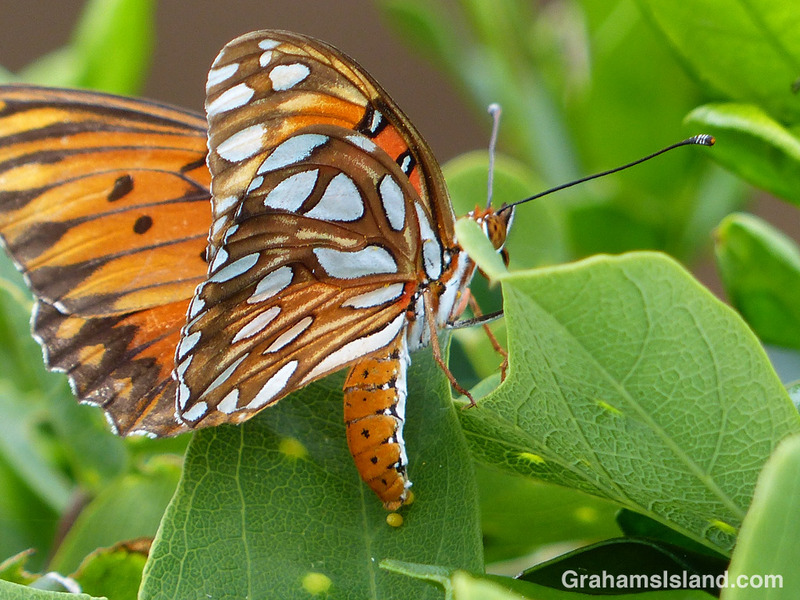 Typically, she deposits a single egg on each leaf, but this butterfly laid two on this one. The butterfly is selective about which leaves to use. She chooses ones that have no eggs on them yet, since this will reduce the competition for her offspring. On the leaf she’s using in the photo are some yellow spots. I thought these might be where eggs had been laid previously, but some passion vines produce these colored bumps to make it look like eggs are already there and thus discourage the butterfly. Not that laying eggs on unoccupied leaves guarantees survival. I saw a number of small parasitic wasps checking out the yellow bumps on several leaves. I have no doubt they do the same with the real eggs. I also saw a very small passion vine butterfly caterpillar snacking on what looked suspiciously like a newly-laid egg. And there’s always the possibility that someone will come along and trim the hedge. Not sure what the vine or the butterfly can do about that. That’s a wonderful photo. Not many people will be able to ‘top’ that. Ha ha. Very good. Thanks for the kind words. I do love catching moments like that. Thanks. I was very happy to capture the optimum moment.